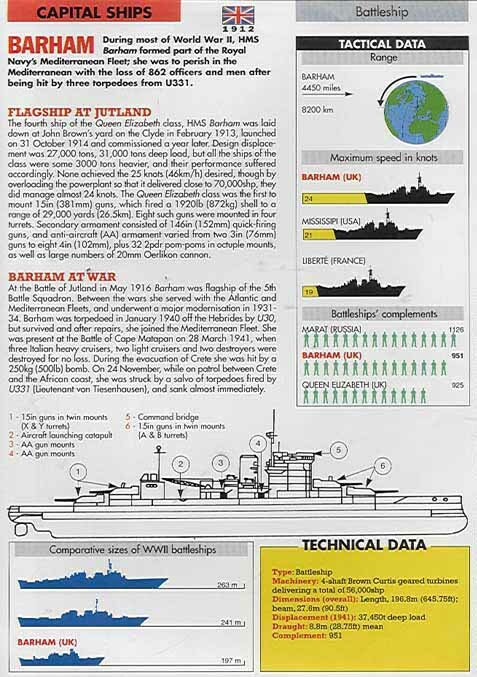 The use of plasma on HMS Barham - did this happen? During the evacuation of Crete in 1941, HMS Barham was damaged on the 27th May when she was attacked by fifteen enemy aircraft which appeared from the direction of the sun. A bomb hit Barham on 'Y' turret and two of her bilges were flooded by near misses. A fire started and was not put out for two hours. Some men were killed and several were badly burned. After the action, the burn victims were treated with plasma transfusions in the Barham's Medical Station. This may well have been the first time that plasma was used in a Royal Naval ship in an action. The history behind this is described in letters home written by my father, Surgeon-Commander E.R.Sorley. Before Barham left Liverpool in late June 1940, after completion of her refit, he met a Professor Davie to discuss the subject of transfusions. A few months later, in a letter home from Scapa Flow, he wrote, "On that last Saturday in Liverpool, Professor Davie mentioned the use of plasma and on my asking for some to keep on board he sent me 5 bottles. In the event of action, these will be of great advantage. Davie is about the foremost authority on transfusion in the country. A later scheme - still in the experimental stage - is the use of plasma dried to powder form which can be made ready for use by the addition of sterile water. Professor Davie has advised the adoption of this scheme - on trial - by the fighting forces. I hope it is adopted." Immediately after the Crete action he described the use of plasma in the following censored letter; "Since I wrote last, we have had a real spot of excitement. I can't give details, but when I say that I have had some grim and grisly work to do, you will understand. The experience was instructive, although naturally I don't want to have it again; yet I still maintain that in the circumstances, we are a lucky ship so far (touch wood). Anyway, all the officers and I are safe and well, so that there is no need to worry. The sinking of the Hood came as a depressing shock to all of us - Henry Hurst P.M.O., Padre Beardmore and several others I knew - all in a puff of smoke and a flash of flame - and then just after our little trouble, came the grand news of the revenge - the sinking of the Bismarck; when the news came to me I was in my action station, sweating and doing plasma saline "transfusions", and you may be sure that we all worked with a happier heart after that. I felt dog-tired at the end of the day, and relaxed my teetotalism. Then I slept like a log, and awoke feeling chirpy." "Let us talk about plasma transfusion. A lecture on the subject is being given this week in the Hospital ship by Clegg, who runs the "plasma bank" there, and with whom I have been co-operating frequently on this vital question. By a fortunate chance taken in Liverpool in 1940, I was the means of introducing the first plasma service in an H.M. ship in the Mediterranean, and ours was the first ship to use the stuff in casualties immediately after action. As I said, this latter fact has been commented on by Surgeon-Captain C.E.Gleeson, Fleet Medical Officer, and forwarded to the proper authorities in a report. The plasma bank has made great strides in the past few months, and almost all the ships are well supplied with plasma saline. I think you know the rationale, but maybe I could go over it again without boring you. When the human body is gravely wounded and much blood is lost, shock sets in chiefly because the stream (and the body) loses so much fluid that the blood in the vessels is converted into a concentrated sticky mass which the heart finds difficult to push around, and circulatory collapse follows. In the same way, if (as happened in my cases) the body is widely burned, the burned parts throw out great amounts of plasma which are lost to the bloodstream, and there again we have a sticky blood flow and collapse. Originally, attempts were made to combat this collapse by transfusion by whole blood - all very sound - but that meant - as you know, the loss of much time by grouping the blood of both the giver and the receiver. The advent of plasma, which is blood minus red cells, meant the scrapping of all lost time and a simplification of the whole business. The early giving of plasma to a burned man or a badly bleeding man brings his bloodstream back to something approaching normal and by countering collapse tends to save his life. And one can go straight ahead immediately after the injury with no need to match about with grouping or searching for a donor, because all one has to do is to defreeze one or two plasma bottles (they are kept in refrigerators) and carry on. All the plasma we have now has been collected from volunteers in this ship. After our May "episode" , I applied for 50 volunteers and had the required number in less than 24 hours. The process was held up by our necessary trip to Durban, but I got on with it when we got back, and now I have enough to give at least early immediate transfusions to over a score of cases if the need should arise. You remember, I wrote an article to the "Gazette" in August 1940, stressing the advantages of plasma and advising its widespread use in the Fleet at home and abroad. I think my suggestion is bearing fruit; but maybe, of course, plans had been made before I "shot a line" about it. I have put the explanation in as simple a manner as possible. It can all be summed up by saying: "Bad burning or bleeding causes shock by thickening the blood, and plasma gives the patient a chance of thinning it again." I only disseminate the idea of others and can only say I was prompt to see the significance of plasma in fighting ships, and to help to prove it by example."